Michael Cole was a stand-out Production and Superbike rider in the late 1970-early 1980 era. He started out racing his own bikes as a struggling “C” Grader and finally graduated to become a Works rider with Honda Australia and with their racing effort overseas. 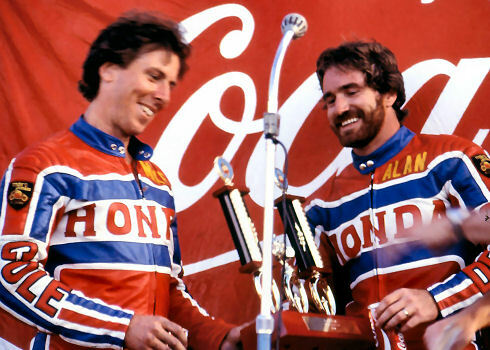 Ken and Mike’s careers went separate ways for a while, but then Ken was offered a production bike ride with Honda in the late 1970’s. Ken was determined to go overseas by this stage, feeling that he had little left to prove in Australia, so, when he was asked to recommend someone else, he recommended Michael Cole. Mike recalls being staggered when he found out. “I was so grateful. I went up to him the next time I saw him and thanked him.” And why not. Ken could hardly have imagined what a boost to Michael’s career this one recommendation was to be. Michael went on to win the Calder Two Hour on the Honda CBX 1000 and the Coca Cola 800 on a Honda 900 and the Arai Endurance classic at Bathurst, amongst many other victories for the team. I asked Michael to rank Kenny as a rider. He said that he felt that Kenny was right up with the best, perhaps just a fraction below Hansford. But he had to battle for rides for most of his career, unlike Gregg who made it with a big factory team, so it’s hard to say. In the last part of his career, for example, he was reserve rider for Honda France, backing up Jean Claude Chemarin and Christian Leon, four times Bol D’Or champs. But he often was faster than them! The problem was simply that he was the wrong nationality, otherwise he’d have made it big with Honda France too. You need to remember, too, that it was the guys like Kenny and others who went to Europe and raced out of the back of a van with no support and sponsorship that made it possible for the Gardners of this world to get where they have gone. I was about to hang up when Michael brought out one more gem. “It was at that Adelaide Three Hour race I told you about. We were running sixth at the last pit stop and Kenny got on for the last hour and flew up to second place. Talking later to Goose (Graeme Muir) he recalled being passed by Ken and thinking that he could hang on to him for a while. He found that he couldn’t do it. Ken just gradually pulled away. But what he noticed most was that, while he was following Kenny, every lap around the circuit, his tyres were just a quarter of an inch from the edge of the track on the entry and exit to the corners, EVERY LAP, EVERY CORNER.” Michael maintains that he, too, had seen the same thing. Kenny knew just how hard to push and could maintain pace, traffic or not. My thanks, also to Michael Cole, owner of Mick Cole Motorcycles at Bega, for making his personal insights available for this special issue.